In our family Viber group chat, my brother expressed his interest in joining the Cebu Marathon in January 2015. He’s excited by the lechon-shaped medal, but he laments that the rates for the good hotels are all too high. I told him to look for Harolds Hotel. He searched for the hotel on Agoda, and was surprised to see how cheap the rates are. 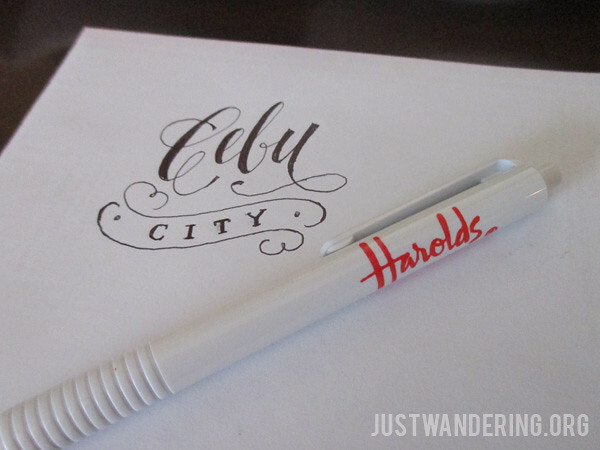 I found out about Harolds Hotel when Agoda arranged for me and my friend to stay there before we leave Cebu. Our flight was fairly early, and we felt much comfortable staying overnight in the city, instead of traveling all the way from Badian. The hotel is located on Gorordo Avenue. It’s close to the I.T. Park, Ayala Center is nearby, homegrown cafes and restaurants are within walking distance, and the Capitol Building is a short jeepney ride away. The Mactan airport is about 40 minutes away on light to moderate traffic. Though there’s only two of us staying in the room, the maximum capacity for each room is four guests. Though it’s not the biggest hotel room, it is spacious enough that you are not bumping into each other. The room has the standard amenities: wide desk, cable TV, wireless and wired Internet connection, personal in-room safe, iron and ironing board, wooden hangers, coffee making things. They also provide hotel slippers, as well as flip-flops, which you can purchase from them for only Php 50. The toilet was clean (and smells clean! ), and comfortably sized. The shower is in the tub in our Deluxe room, though separate shower stalls are available in their Executive suites. The best thing about our room though are the beds. The mattress was comfortably firm, the pillows were plush, and the linens and duvet have a high thread count, which makes you just want to stay cocooned inside. Harolds Hotel has two restaurants: the Highlights Lounge and the H Cafe. The H Cafe offers all day dining, including breakfast, lunch, and dinner buffets. They offer a nice selection of local and international cuisine, and also have themed lunches or dinners. 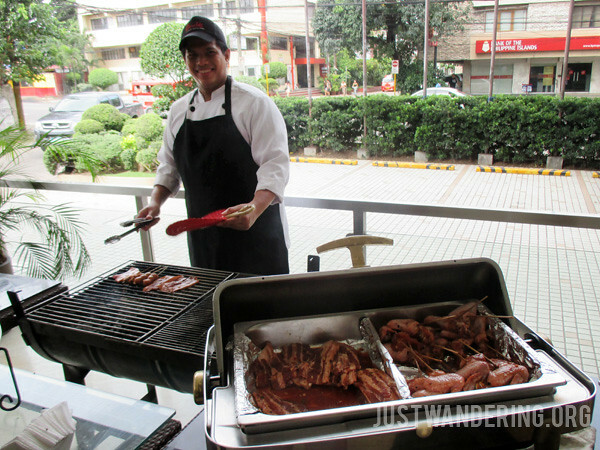 When we arrive there, they were offering barbeque at the lunch buffet. This is great if you want to have the Larsian experience, but don’t have the time to go there (or cannot stand the thick smoke inside). You can choose different types of meat, which includes the Cebuano chorizo, and they will deliver it to your table once cooked. For the complete experience, there’s even puso! The buffet rates start at Php 388 per person. Not bad, eh? They also have Coffee and Cakes in the afternoon, where you can get one slice of cake and unlimited brewed coffee for only Php 88. 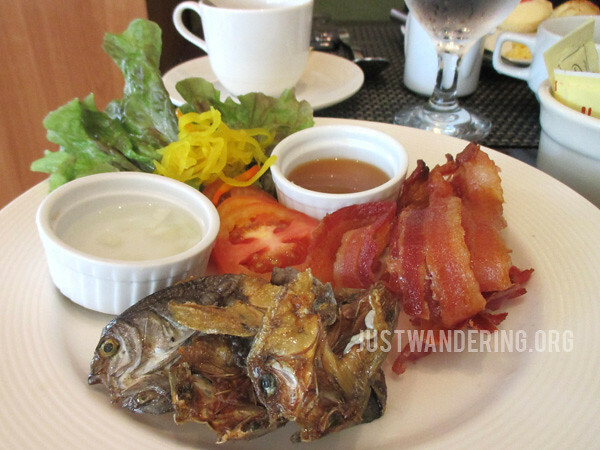 Here’s a little tip when you have breakfast at H Cafe: ask for danggit or bacon. They are not served in the buffet, but they’re available upon request. This ensures that they are freshly cooked and perfectly crispy when served (with pinakurat on the side, even!). They also have native tsokolate, and it’s GOOD! It’s a pity that we only stayed for such a short time at Harolds. 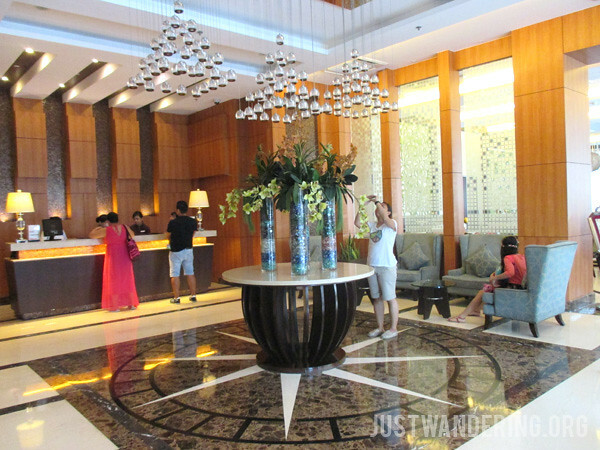 Though it’s a bit far from most of the tourist attractions, the Ayala PUV terminal is nearby, and there are plenty of public transport that pass in front of the hotel. 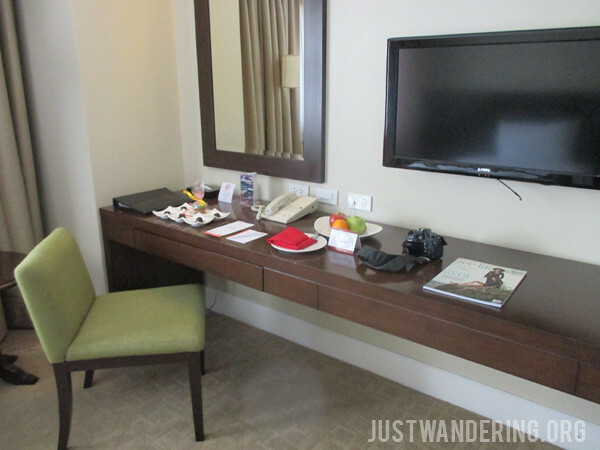 It’s very comfortable, and considering the price, it’s a good value accommodation option in Cebu. 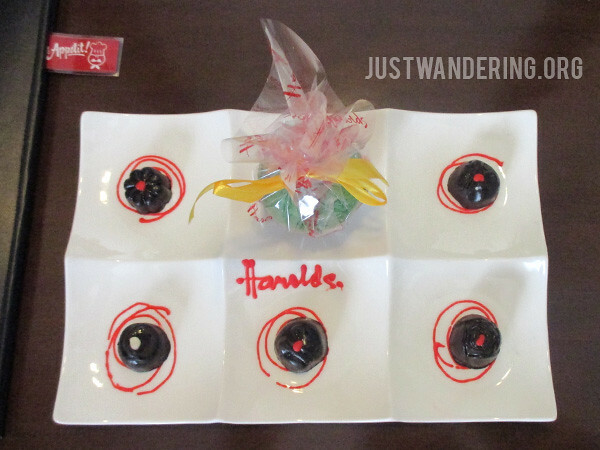 Also, there were chocolate pralines waiting for us in our room when we arrived. Best welcome ever. 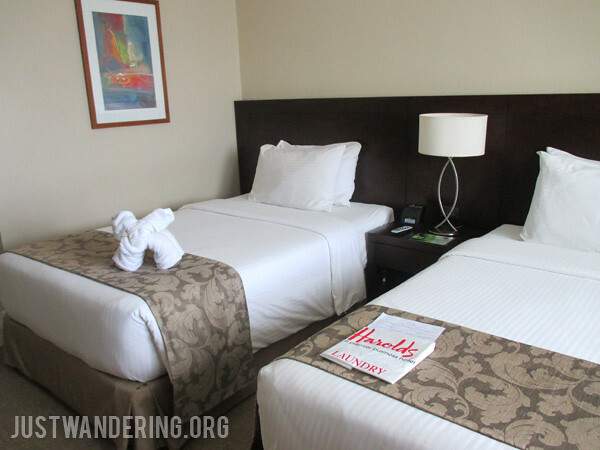 More photos of Harolds Hotel available at the Just Wandering Facebook Page. Thank you once again to Agoda.com for this opportunity, and to Harolds Hotel for the wonderful stay!